Sharks, shark attacks and shark nets. You’ve probably heard the conversation in the media in recent times as our nation figures out a solution to ‘protect ourselves’ from a shark encounter. In response to a number of shark confrontations along the NSW northern beaches (including popular spots Byron Bay and Ballina) the NSW government has carried out a comprehensive review on deterrent and detection methods to improve swimmer and surfer safety. Ocean Life Education has long now been an advocate of education for public safety in and around our waterways. What we aim to achieve in our programs like our Shark Discovery, is a deeper understanding of sharks; the safest time and places to swim and why we sometimes come into contact with sharks. As a long-time sceptic of the effectiveness of shark nets that are reported as protecting our popular beaches, I am delighted to see that the NSW government is reviewing both deterrent and detection methods for their northern beaches, which means that shark welfare is being considered as part of their review process. The review mostly focuses on results of the effectiveness of such methods on the Great White, Tiger and Bull Whaler sharks and includes fourteen deterrent strategies and three detection strategies. 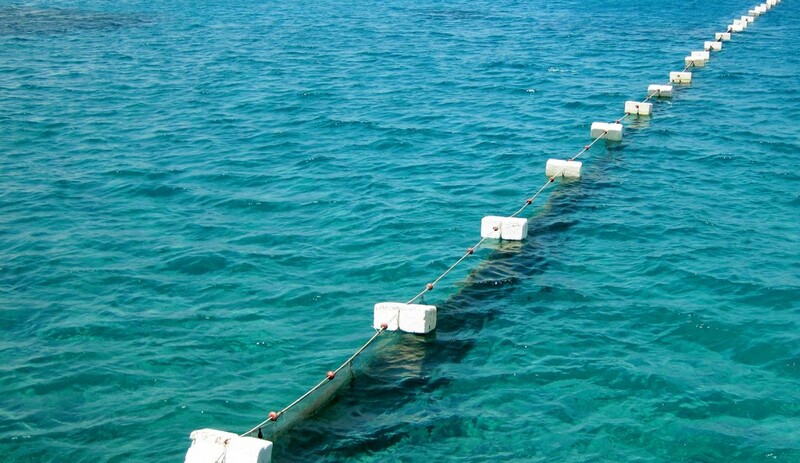 Of the deterrents, four involve electric and electromagnetic nets, ropes and cables; three are barrier nets (non-entanglement nets); five are various personal devices (worn by surfers or swimmers); a bubble curtain; and the Smart Bouy system (similar to a drum line but with capability to alert when a shark is caught so it can be quickly released). The results showed the barrier nets were most effective, however the trials for these nets were carried out in Western Australia at a relatively protected beach where wave heights never exceeded 1.5m, therefore not a great indicator for open East Australian beaches that can have six-plus meter waves. Not only that but keeping the barriers clean of fouling was another concern. The electronic devices were problematic to other animals’ sensory abilities and also problematic to humans with heart problems who may use pacemakers. Personal devices varied in effectiveness but deemed not practical to protect great numbers of people at large beach sites. While the bubble curtain is an unobtrusive idea to humans and animals alike it wasn’t highly effective at deterring sharks. Finally, there was the Smart Buoy which is just a baited drum line, with ability to alert it’s managers of a hook up, allowing the shark to be relocated. The problem here is using a baited hook brings sharks in and catches them, but also dolphins and turtles get caught too, plus staff managing relocation of animals need the right equipment and training to relocate effectively. There were three detection methods trailed: shark spotter program; clever buoy; and tagging and real time tracking of tagged sharks. The shark spotter program proved the most effective method of detection, the only problem is the shear expanse of coast line that needs to be monitored along the NSW north coast, which would incur a large expense. Tagging and tracking sharks has been used by scientists for a long time now, it is effective in tracking sharks’ movements but not practical in being able to tag all sharks. Thus, this strategy rated low on the review. Of great interest was research into technology such as the ‘Clever Buoy’, a collection of detector buoys, using sonar technology to detect large moving objects, which then sends a signal to a shore base to advise swimmers (for example a life guard tower). This detector method would keep swimmers safe and prevent the death of any marine life. It’s a win-win situation in my books. Watch the video by Optus about how the Clever Buoy technology works. The review did mention that this was in trial phase and needed tweaking, but with increasing technology improvements, this kind of protection for beaches is three to five years away and is both a good result for swimmers and the environment. In 2017 we can say keep an eye on the future, it looks bright. It is great to see an improved environmental approach to an ongoing problem of humans living in harmony with the marine environment. If NSW adopts this technology and proves its effectiveness we hope that Queensland will follow suit. This entry was posted in Marine Education and tagged cleverbuoy, marine education, shark education, shark nets, sharks on January 17, 2017 by oceanlifeeducation. Ocean Life Education Marine Officer, Meaghan Smith is also a PhD student taking part in an important research project to help save the Great Barrier Reef. 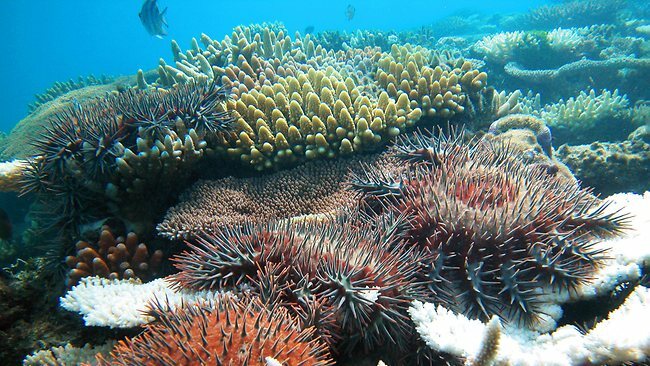 I am currently mid-way through my PhD in Molecular Biology studies at the University of the Sunshine Coast in collaboration with the Australian Institute of Marine Science, with a project focusing on the neural biology of the Crown of Thorns Starfish (COTS), Acanthaster planci. The aim of my PhD is to elucidate the neural peptides involved in the biology and physiology of these coral eating critters on the Great Barrier Reef! With the Crown of Thorns Starfish outbreaks a continuous threat to the reef, my project explores the molecular basis of reproduction and chemical signaling molecules used by the COTS during events such as aggregation and spawning in aide of developing novel biocontrol methods. Although there are emerging technologies and methods to control COTS numbers on the reef, there still remain gaps in the knowledge surrounding the COTS biology. What do we know about Crown of Thorns Starfish? COTS are avid coral feeders, with an adult animal capable of consuming up to 10m2 of coral annually. Due to their venom, COTS have very few predators. One predator with key biological attributes in conquering the COTS is the Giant Triton Snail- however due to overfishing the dwindling numbers of tritons on the reef escalates the problem. COTS are the most fecund of echinoderms with an adult female capable of spawning up to 150 million eggs per season. COTS are seasonal broadcast spawners with the reproductive season being the warmer summer months in Australia. During reproductive season, COTS are noticed to aggregate together and display a synchronized spawning event. The males will synchronise their spawning, with the surrounding females spawning within 30 minutes of this event. It is believed the COTS fertility success rate exceeds 70%. This may be due to increased algal feed for juvenile seastars which contributes to the success. COTS appear to survive months without any feed (up to 12 months in my current laboratory studies). This is concerning as it demonstrates COTS can withstand hostile environments whilst still maturing reproductively. COTS outbreaks are a natural occurrence of the reef ecosystem- however numbers on the northern great barrier reef are currently catastrophic. This is a controversial issue with theories suggesting increased nutrients in the water could be a factor contributing to the population success, as is the increase in ocean temperatures due to increased viable algal feed for juveniles. My aim is to gain a greater understanding of the neuropeptides and neurotransmitters used by COTS for this maturation, aggregation, spawning and reproductive physiology. Initial results are revealing some very exciting and unique biological attributes to the COTS and will hopefully aid in future control of the COTS crisis! Thanks for sharing your incredible insights with us, Meaghan. Keep up the great work! Meaghan recently featured on Channel Ten’s Totally Wild television program. 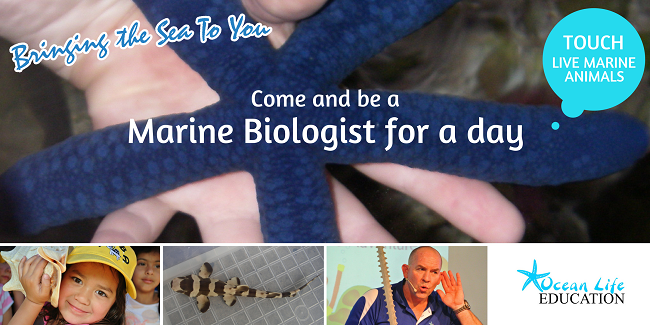 Check out our range of Programs for schools and early learners to learn more about the marine environment! This entry was posted in Marine Education on January 5, 2017 by oceanlifeeducation.